G95 filament LED decor bulb with amber tinted glass. 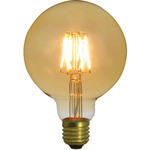 The bulb can be dimmed to give a choice of full illumination or subdued ambient lighting. 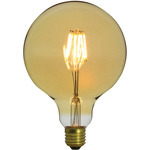 Designed to offer contemporary performance for vintage themed lighting schemes and styling. 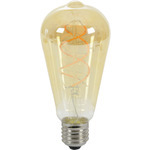 G125 filament LED decor bulb with amber tinted glass. 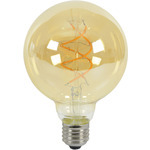 The bulb can be dimmed to give a choice of full illumination or subdued ambient lighting. 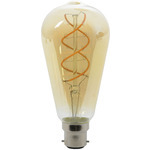 Designed to offer contemporary performance for vintage themed lighting schemes and styling. 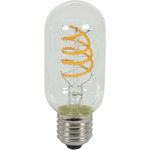 Dimmable LED replacement T45 bulb with decorative spiral filament. The warm white colour temperature combined with amber coated glass envelope invokes a retro ambiance. Energy efficient drivers can be used with LED compatible TRIAC dimmers to provide controllable illumination in vintage styled lighting schemes. 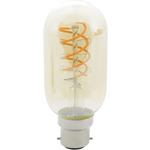 Dimmable LED replacement G95 bulb with decorative spiral filament. The warm white colour temperature combined with amber coated glass envelope invokes a retro ambiance. Energy efficient drivers can be used with LED compatible TRIAC dimmers to provide controllable illumination in vintage styled lighting schemes. 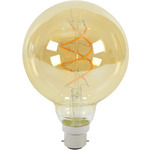 Dimmable LED replacement ST64 bulb with decorative spiral filament. The warm white colour temperature combined with amber coated glass envelope invokes a retro ambiance. Energy efficient drivers can be used with LED compatible TRIAC dimmers to provide controllable illumination in vintage styled lighting schemes. 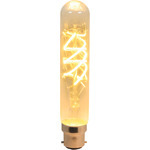 LED replacement T30 bulb with decorative spiral filament. The warm white colour temperature combined with amber coated glass envelope invokes a retro ambiance. Energy efficient drivers deliver stable power and provide useful illumination for decorative yet functional lighting schemes.